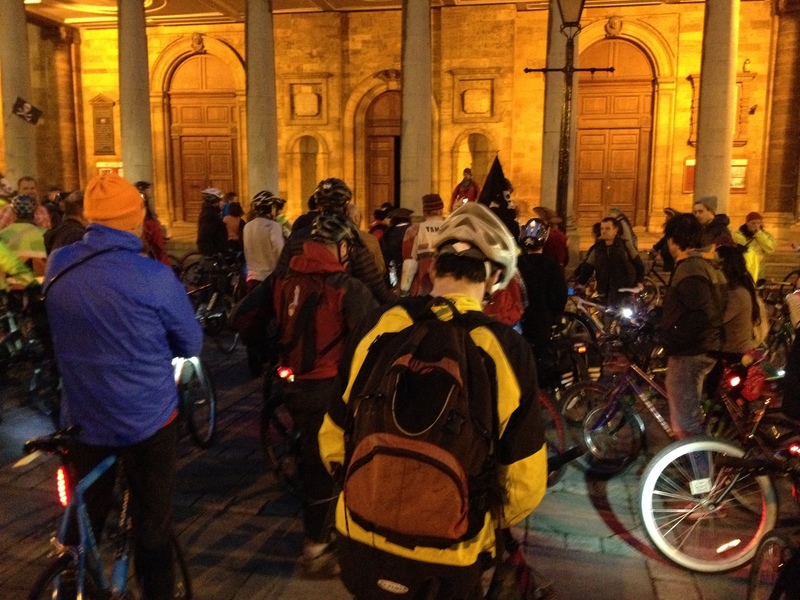 Happy 1st Birthday, Critical Mass Northampton! 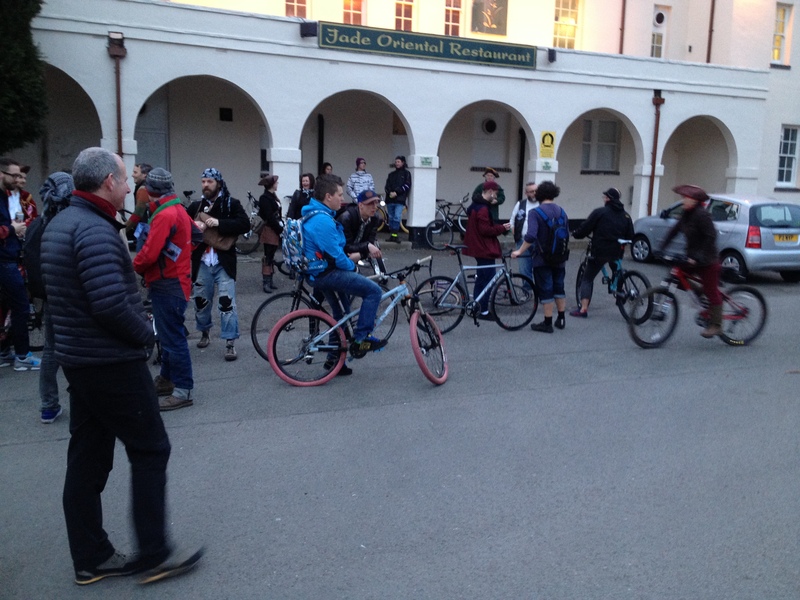 On Friday evening, in common with most Critical Mass meetings throughout the world, Critical Mass Northampton met for a ride – and with a difference because this celebrated a year of rides. It was CM Northampton’s 1st Birthday! We shared this 1st Birthday with Critical Mass Tetovo in Macedonia and exchanged birthday greetings! We met at The Racecourse, slightly later at 6.30 p.m. (Usually the rides start at 6.00 p.m.) and many participants joined the “pirate” theme by dressing themselves and their bikes. Sorry! Never thought to take pictures of the best ones. On rider had a trailer with what looked like a cannon from a pirate ship together with a skull-and-crossbones flag! Enjoyed chatting with friends old and new. Good to see David out for probably the first time since his “off” in Walgrave a month ago. Then we set off, about ninety of us at a conservative estimate – plenty of left turns – and the Mass continued through junctions and traffic lights to a pause in the town centre, the square at the front of All Saints Church. Alex S came up and said hello; I hadn’t spotted him before this and, like my previous CM, we chatted so much that I couldn’t have told you the route we took to our final destination if I hadn’t switched my iPhone app on! The route is here on Endomondo. The final destination was The Pomfret Arms on Southbridge. Beer, music, barbecue and cheese plates. 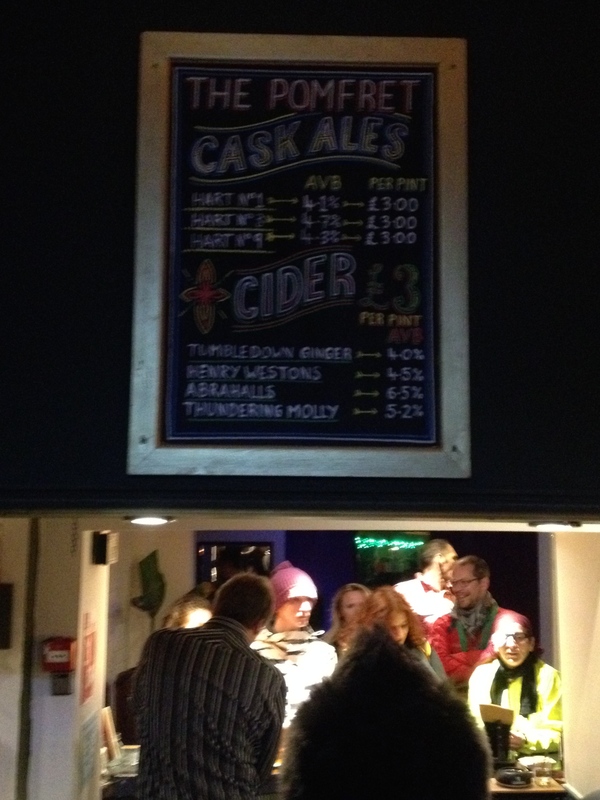 Beer from Hart Family Brewery – I sampled the No 9 from the cask. You won’t believe I eschewed the barbecue in favour of the cheese plate from St Giles Cheese – Keens unpasteurised vintage farmhouse cheddar, Fourme d’Ambert and Delice de Bourgogne with sourdough bread and quince membrillo. OK, I had to ask about the last item. Turns out it’s a quince jelly made in Spain. Then home. Four miles on CM, eleven miles door-to-door. 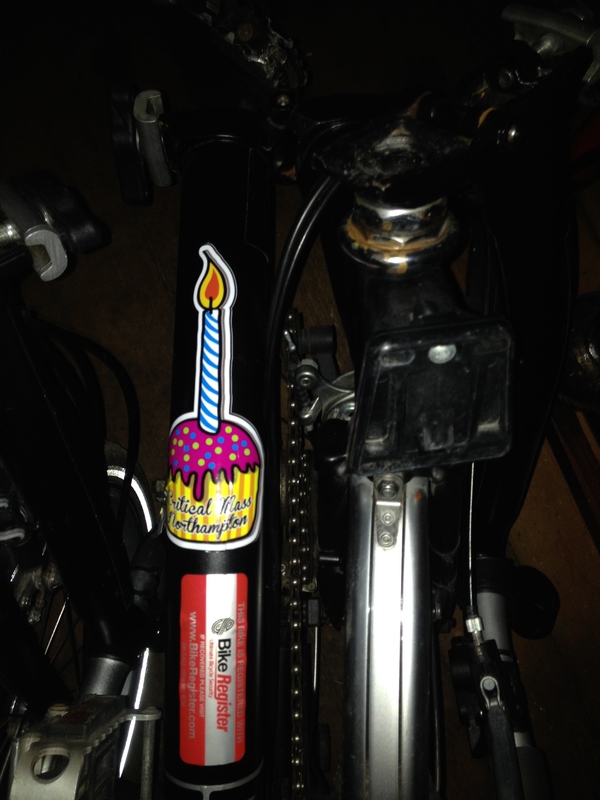 Oh, and there were birthday stickers too for the Brompton! Excellent!